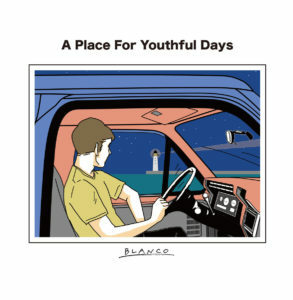 Tokyo’s Blanco first popped up on this year’s Die In Pop compilation via Ano(t)raks, with the song “Paradise.” That number rounds out this new release A Place For Youthful Days, offering a bit of a contrast to the other number present here. Let’s start with “Paradise,” though, as it is familiar both because of timing and because of a structure leaning toward tradition, the whole thing one big melancholy gallop, broken up by some electronic squiggles and longer guitar passages. What really makes it stick around, though, is the decision to keep the vocals on the fuzzy side, giving this one a slightly more blurred feel than other straightforward indie-pop efforts. And that is also the connecting tissue to opener “Isolated City,” which moves at a slower pace but lets a nice wave of feedback and synthesizer soak over it to give it a similarly out-of-space feel. Get it here, or listen below.